This one is my own creation that I made shortly after Amplitube was released for iPhones but by now I am sure many other people have created their own much more advanced DIY iRig cables. You may be able to pick up a iRig cheap second hand but at the time that I had made this you were only going to get an iRig if you were lucky or paid $40 which even to this day I still think is too much for it. So lets get started. 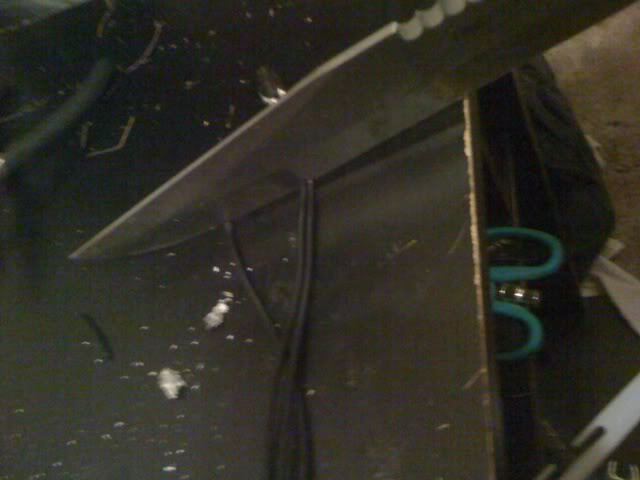 Instead of wire strippers I used a small knife. 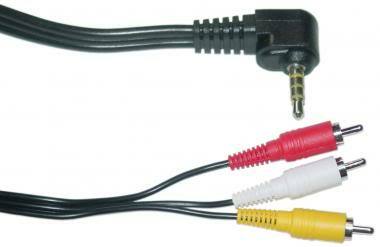 See those 3 colored plugs on your RCA cable, cut those off and throw them away, you will no longer be needing their services. Label the color of each cable those, if the inner coating of your cable is also color coded then you do not need to bother with labeling the wires. Remember to cut close to the actual plugs to insure you have plenty of wire to work with in case of mishaps where you may need to cut some more off and start over, if this happens to you then don't feel bad cause it happens to everyone some times. 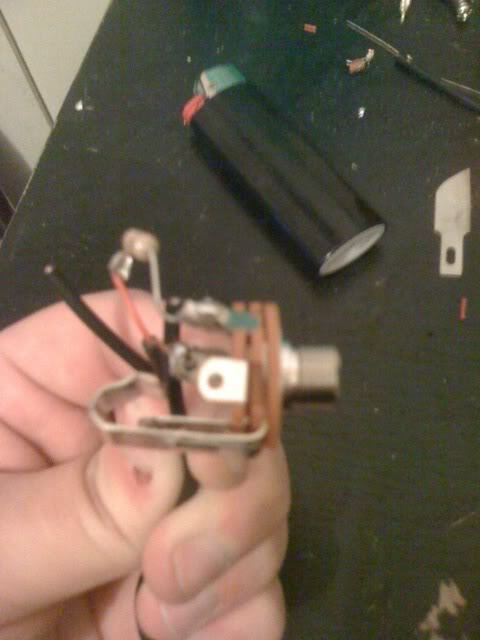 Now that we have liberated the wires from those evil plugs we can begin step 2. Get out a hobby knife or wire strippers and remove roughly 1 inch of the outer coating/shielding from the wires, then remove 1/4 inch of the coating from the inner wire as demonstrated in the image to the right. Repeat this for all three wires and prepare for step 3 by getting your soldering iron heated up and proper tinned. 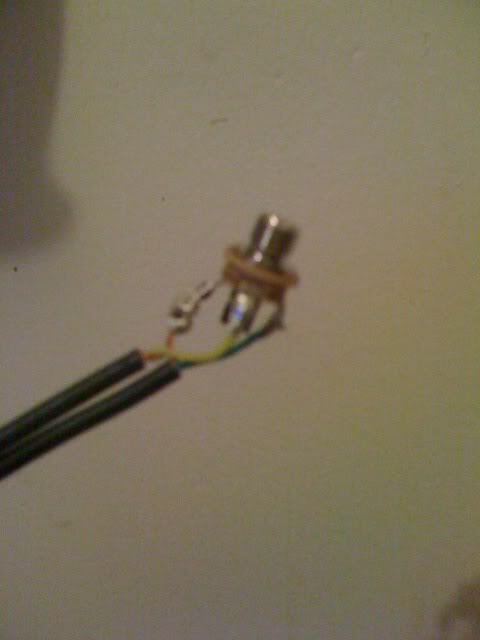 Solder your red wire onto one of the resisters leads. Now solder the other end of the resistor to the middle ring on your 1/4" cable then solder your ground wire to the top ring "the ring connected to the arm of the plug" so it looks like the pictures shown on the right. Now solder the ground wires you just wrapped to the very bottom ring on the jack. Then solder the yellow to the middle ring, then the white to the top ring. You have finished your DIY iRig. 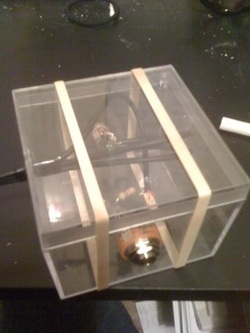 Now if you would like you can use something to help prevent damage to the wiring and soldering. I have used everything from plastic boxes to small pill bottles to house mine. This container was my favorite, I thought it looked cool and to top it off the rubber bands I used to keep the lid on it also did a good job of keeping it from sliding around on my desk, table, work station, or what ever I happen to have it sitting on when I played.